•	Easy Start-up: While moving to another office space from your current location, setting up a new office might take a lot of time and labour. But when you chose a fully-furnished office space at Altrade Business Centre, everything is set for your business to dive straight into your work without worrying about setting up the furniture and interiors. This incorporates everything from work areas, tables, chairs to other office gears. Along these lines, in making the move to one of our workplaces, you can rest guaranteed there will be definitely no time squandered in setting up the workplace and can concentrate on your business while we take care of everything else. •	Affordable: For any business, staying within a budget plan is a must. When you are simply beginning or hoping to grow, costs can at times cause you to need to make penances. Fully-furnished Office Space in Gurgaon at Altrade Business Centre provides all the functionalities without the huge tag price. Hence, leasing a completely outfitted office is definitely more reasonable than outfitting an office by yourself. Not only will you not need to buy the furnishing items, but will also be saved from the installation charges and setup expenses. 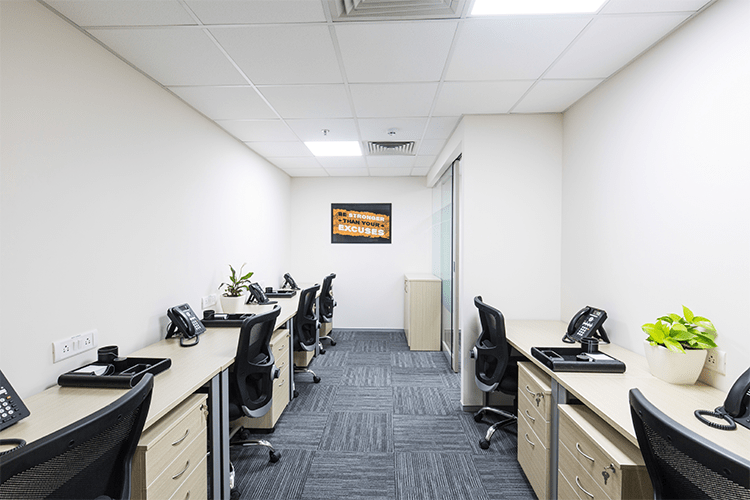 •	Professional atmosphere: A modern and fully-furnished dedicated Office Space in Gurgaon at Altrade Business Centre gives a professional and positive atmosphere to you and your business along with the professional image reflecting your brand & business. This will not only give you a distinguished name in the market but will also keep your business in the upfront with the prestigious address and location while working in a focused & dedicated atmosphere of the workspace. •	Add-on Facilities and services: Another advantage that comes very handy when selecting Altrade Business Centre for a furnished office space in DLF Cyber City Gurgaon is the wide range of add-on facilities and services that are accessible for your business needs like 24/7 internet connectivity, office supplies, conference rooms & meeting rooms available as per requirement, refreshment areas, dedicated parking spaces, technical support staff, reception services, and mail & courier services. •	Take care of growing business: The fully-furnished office spaces at Altrade Business Centre offer the factor of flexibility, allowing your business to scale-up as your business grows with time and lets you move to a larger office space as and when required.